Denver and Marquette are both BIGEAST contenders this year and yet they haven’t met since the 2014 season. An exciting weekend is in store as the BIGEAST Tournament presented by New York Life is both still not set and dependent on the outcomes of this weekend’s slate. All the hype is behind DU. They’re currently on a six-game streak after a mid-season loss to Ohio State and sit No. 5 in the national rankings. With a record of 10-2 overall and 4-0 in their conference, a loss to Marquette could actually upset chances of them seeding No. 1 for their conference tournament. As it stands, Marquette is currently 10-4 overall and 3-1 in conference. They had their win streak early in the season, starting undefeated through seven games, then dropping the streak-breaker to Georgetown. This week, they’re looking the reclaim their stance coming off a loss to Duke 15-8. This is a crucial week, as Marquette can be beaten early due to Duke and upcoming Denver, or it could be the last minute momentum builder every team looks for before postseason. Thus far in the 2015 season, Denver has been an interesting team to watch. They came into the season fired up to start against Duke, and they reclaimed their dignities with a win, followed by a run over Air Force in the Frontier Airlines Classic. They then went to UNC and took a hit from the Tar Heels, who themselves were building up spotlight by potentially being the first team to 9-0 in 2015. Denver hosted Notre Dame the following week, and entertained with a nail-biting, edge-of-your-seat OT thriller victory to upset the Fighting Irish. A loss then to the Buckeyes and now on that 7-game streak. Marquette had the opposite experience, coming out of the gait hard, and recently hitting road bumps. For anyone who follows NFL football, Marquette is in the driver seat with the loss having just happened, whereas DU is due for a loss and NFL fans would get worried about postseason endeavors. 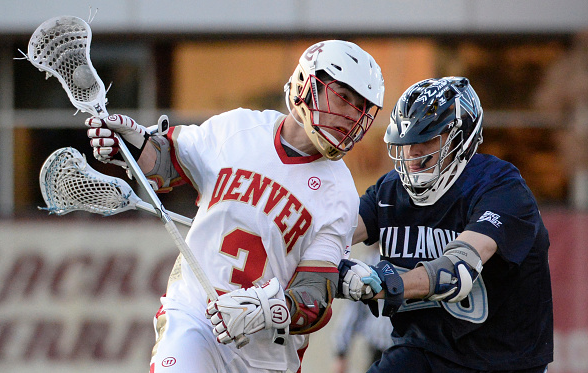 If Denver wins against Marquette, they (DU) will be 5-0 in the conference and secure the No. 1 seeding for their tournament. However, if Marquette upsets, both teams will be 4-1 in BIGEAST play. The tie-breaker would then be decided in the Georgetown versus St. John’s game. Georgetown will need to win to give Marquette a secure No. 1 seeding. Thirdly, if Marquette upsets AND Georgetown loses to St. John’s Marquette is still No. 1, DU No. 2, and Georgetown No. 3. The rest of the brackets will fall into place appropriately. If a situation arises where there are low-rank ties, goal differentials are incorporated in the decision. The BIGEAST has had four teams in the spotlight all season, and DU and Marquette have been Top 20 ranked the majority of the 2015 season. Faceoffs should be a major concern for Marquette and DU freshman Trevor Baptiste has been lighting up the face-off dot. He’s performing at a .716 win percentage compared to Marquette’s .446 from K.C. Kennedy majorly. The Pioneers have in interesting offense. They seem to run a 2-3-1 and when activated, the entire offense seems to crash the crease. This causes a ton of confusion in front of goaltenders and distractions from the one or two players standing outside for dump passes. Zach Miller and Connor Cannizzaro can effectively penetrate defensive zones while Wes Berg can attack the net from outside. Marquette could beat DU with transition advantages, like beating them on fast breaks. The DU defense has been quite solid this season, and of everything taken into account as well as my sideline observations, it seems the Pioneers defense struggles with 5th/6th man slide or a high volume fast break. If Marquette can get down on fast breaks for a 5 -or- 6 on 3 -or- 4 advantage, that may be the most effective way of scoring. Gametime is set for Saturday April 25th at 1pmCST/2pmEST at Hart Park in Wisconsin. Game will be nationally televised on CBSSports Network.